The Webman has done a lot of traveling over the years for business and for pleasure. About 90% of that has been domestic travel so I am hoping to inverse that to 90% international travel in the years ahead. Time to see the world! Most of the places that I have stayed have been your very typical hotel chains such as the Marriott, Starwood, Hilton, Hyatt and all the others where we could get points and hopefully cash them in for an upgraded family vacation at a later date. For those that have done extensive business travel, you know what I am talking about. Not much join in this but accumulating a few million points – priceless. Unfortunately even these small benefits are now being taken away by companies. The last company I worked for actually had their own account for the airline miles that I traveled so that they could benefit with lower fares. I get it but geez, let the employees get some benefit on this. AIRNB connects people who have space to spare with those who are looking for a place to stay. Guests can build real connections with their hosts, gain access to distinctive spaces, and immerse themselves in the culture of their destinations. Whether it’s an urban apartment or countryside castle, AIRNB makes it effortless to showcase your space to an audience of millions, and to find the right space at any price point, anywhere. And they are growing like a weed. It booked 4 million nights of accommodation in users’ homes in 2011 — that’s four times the amount of business it had done in the previous four years. Most of this growth (75% of it) came from outside the U.S. — from Europe, for the most part. 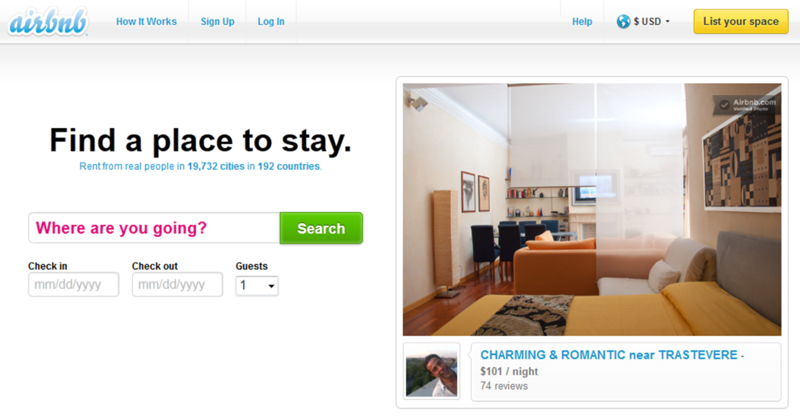 London, Paris and Berlin are three of Airbnb’s five biggest hotbeds of listing activity. I have not used AIRNB myself yet but will when I can. Let me know what your experience has been by commenting below. Previous postSt. Paul’s Chapel – Coincidence 2? Next postPinterest – Go Visual!